The bottle opener: it’s as essential to summer parties as sunscreen. This assortment of bottle openers includes a minimalist design in sturdy titanium, spirited shapes in cast iron, and an opener that doubles as a keychain. When someone asks you to crack open a beer at your next get together, opt for a design-conscious, innovative opener. From Umbra Shift, the Roll Bottle Opener is a sculptural bar accessory that may trick your guests into thinking it’s a work of art. Each “spoke” in the wheel-shaped bottle opener can be used to open a beer bottle, and it’s a cool enough accent to leave out on the bar or counter when not in use. 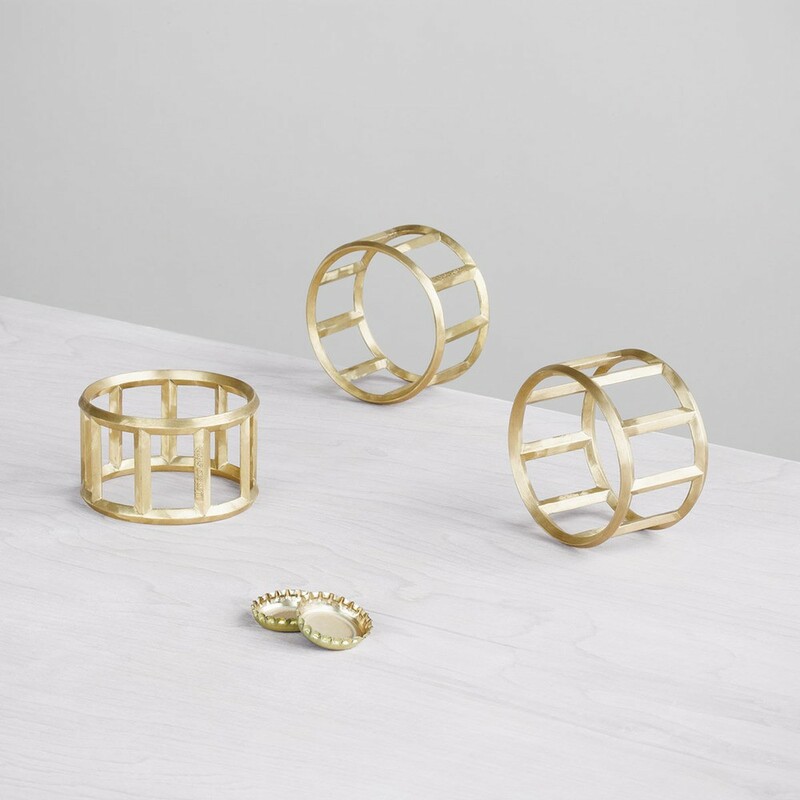 This brass bottle opener can even double as a bangle bracelet, making its wearer an undoubted party favorite. Designed to look like a real hammer, this bottle opener is hand-forged in the traditional Nambu Tekki cast iron method. First made in the mid 17th century in Japan, nambu tekki is a celebrated Japanese craft, still popular today. The black color of the bottle opener is derived from a lacquer glaze called urushi, which craftsmen use to prevent rusting on the iron pieces. This bottle opener resembles a real hammer, both in look and feel, making this piece a conversation starter that is both entertaining and functional. The streamlined Titanium Bottle Opener from Brooklyn’s Pat Kim Design is a simple bar accessory with a sophisticated and minimalist look. The bottle opener includes a leather loop that can be used to hang the opener when not in use. The durable opener is comprised of a simple cylinder with a carefully designed opening that will open bottle caps. Thin enough to fit in one’s pocket, this opener is a great summer party accessory. A Dwell Store exclusive from J. L. Lawson & Co., this key shackle and bottle opener is defined by its anchor shackle inspiration, geometric silhouette, and triangle pin that keeps the key shackle closed. The simple and refined piece is precisely cut within thousandths of an inch, requiring tremendous attention to detail and skill. This bottle opener is a multi-tasker that is created to inspire new traditions and to be passed down from generation to generation. Designed by Brendan Ravenhill for Areaware, this bottle opener is designed with ultimate functionality in mind. Carved from walnut wood and featuring a contrasting black painted handle, the simple bottle opener contains two small magnets—one that allows the opener to stay on a refrigerator door when not in use, and another that catches the bottle cap after its been opened to avoid the hassle of a runaway cap. The opening mechanism—a bent nail—gives the opener an uncomplicated and utilitarian sensibility, making it straightforward and useful. The Hex Bottle Opener from Iacoli and McAllister is made from a solid brass hex bar and features a simple, sophisticated shape and an unobtrusive matte finish. Featuring a simple cut shape for opening bottles, the Hex Bottle Opener looks almost as if it was intended to be a small sculpture. With such appealing looks, this is one piece you’ll want to keep out of the utensil drawer when not in use.